When you really think about it, our society and the various systems that we live under are run by psychopaths that use threats and intimidation to get us to comply and obey their rules, regulations. You can’t challenge, disobey, and most certainly, you can’t show any disrespect for their authority. If you do, you will be marked and put on notice with even more threats and intimating tactics. 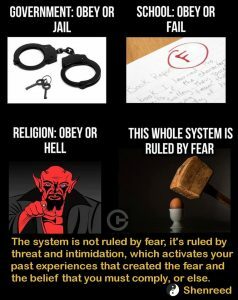 The system isn’t ruled by fear; it’s fueled and runs on the fear energy that is denied expression. They feed off the energy (our energy) that we deny when we are triggered into our fears. The more we face our fears and heal them, the more fearless we become and the more they try to control the masses and those that they feel will upset their apple cart, the more their power is being diminished. The only reason they feel more rules and controls are needed is because the present ones don’t seem to be doing the job. This entry was posted in Conspiracy - NWO, Fear - Terror, Politics - Government, Quotes, Religion, Science - Technology, Self-Empowerment, Society - Culture and tagged control, intimidation, power, threat by johnrieger. Bookmark the permalink.